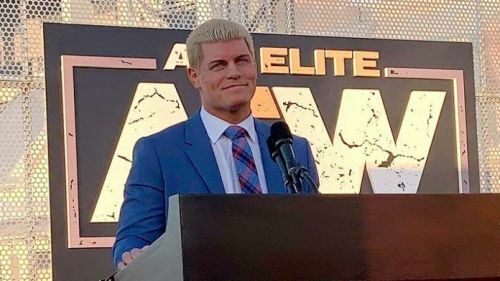 Former WWE superstar Cody Rhodes has taken the Pro Wrestling universe by storm following the major announcement of the inauguration of All Elite Wrestling. Several wrestling legends and pundits have already weighed in their opinion on AEW thus far and another man who wasn't shy of letting his feelings known is non-other than WWE Hall of Famer, Mark Henry. Cody Rhodes along with his Elite stablemates, Nick and Matt Jackson- collectively known as The Young Bucks- recently joined forces with billionaire business Tony Khan in order to inaugurate their own and brand new wrestling promotion, All Elite Wrestling. Following the announcement of AEW, members of The Elite held a Press Conference where they would go on to reveal the first several superstars who were signed under AEW including the likes of WWE Hall of Famer Chris Jericho, Dragon Gate star Pac, Joey Janela, and the first ever female superstar of AEW, Britt Baker. WWE Hall of Famer, Mark Henry recently took it to his official Twitter handle and sent out an inspiring message to his former WWE colleague Cody Rhodes for the immense amount of success that he has received since the inauguration of All Elite Wrestling. Henry's tweet was short but was definitely effective, as the former World's Strongest Man claimed that he is proud of Cody Rhodes for the work that he has done and has been doing since his departure from WWE in 2016. Rhodes, obviously, was a huge part of both Ring of Honor and New Japan Pro Wrestling since departing from WWE in 2016 and continues to grow his legacy with the work and effort that he has been putting in. All Elite Wrestling's first ever show is scheduled to take place in Las Vegas, Nevada later this year and the show is billed as Double or Nothing.